The Miami Dolphins had QB Dan Marino (pictured above) back behind center as they hosted the New England Patriots in a season-opening game on September 4, 1994. After ten years of highly-productive, and often record-setting, passing while remaining injury free, Marino had been lost to a ruptured Achilles tendon five games into the ’93 season. Head Coach Don Shula’s team had initially weathered the loss of Marino well and was at 9-2 before losing five straight games to close out the season and miss the playoffs at 9-7. The receiving corps, led by WR Irving Fryar, was capable while the running attack was mediocre, with RB Terry Kirby more productive as a receiver out of the backfield. However, it was key injuries on the defensive side that ultimately sank the Dolphins, and improvement was anticipated. New England was coming off of a 5-11 record in its first year under Head Coach Bill Parcells, but after five straight losing seasons there was reason for optimism. QB Drew Bledsoe had a year of action under his belt, TE Ben Coates emerged as an outstanding receiver, and the defense, led by MLB Vincent Brown, was much better. There were 69,613 fans in attendance at Joe Robbie Stadium and there was a heavy downpour an hour before kickoff that turned the baseball infield portion of the field into a muddy mess. The game started off quietly enough as the Patriots went three-and-out on their first possession and Dan Marino misfired on his first two passes before Miami moved to the New England 39. However, in attempting to convert a fourth-and-one play, Terry Kirby fumbled and FS Myron Guyton recovered for the Patriots. New England drove 59 yards in 11 plays. Drew Bledsoe started off with a completion to RB Leroy Thompson for 20 yards and, after the loss of a yard on a running play, connected with WR Michael Timpson for 12 yards. It was RB Marion Butts carrying most of the load from there as the Patriots kept the ball on the ground and FB Kevin Turner gained the last yard for a touchdown. Matt Bahr added the extra point and the home team was ahead by 7-0. The Dolphins responded with a long series that stretched into the second quarter. Marino completed six passes along the way, four of them to Kirby, but after reaching the New England six his throw intended for FB Keith Byars was intercepted by LB Dwayne Sabb. The teams exchanged punts before the Patriots advanced into Miami territory, fueled by a 28-yard Bledsoe-to-Timpson pass play. Bledsoe had two more completions before being picked off in the end zone by CB Troy Vincent. Three plays later, Marino fired a pass to WR Mark Ingram for a 64-yard touchdown. Pete Stoyanovich booted the point after and the score was tied. The Patriots responded with a scoring drive of eight plays that covered 68 yards. Bledsoe had four pass completions, the two biggest to TE Ben Coates for 26 yards and Turner for 19, to reach the Miami two and from there he tossed a TD pass to Coates. Bahr again converted to put the visitors up by seven with 2:15 left in the first half. There was still time for Marino to pass the Dolphins into scoring position and, on the final play of the half, Stoyanovich kicked a 42-yard field goal and the New England lead was 14-10 at halftime. A short Miami series to start the third quarter ended with a punt but, on their second play, the Patriots came through with a big one as Bledsoe (pictured at left) threw to Coates for a 62-yard touchdown. Bahr’s conversion stretched the New England lead to 21-10. The teams again traded punts before the Dolphins, striking quickly, got back on the board. Taking over from their 39, Marino went long to WR Irving Fryar for 40 yards to the New England 21. A run for five yards that was followed by a holding penalty and then an incomplete pass had the home team facing third-and-15. Marino then connected with TE Keith Jackson for a TD from 26 yards out. Kirby dove into the end zone for a two-point conversion (the first in team history) and the New England lead was cut to 21-18. FS Gene Atkins intercepted a Bledsoe pass on the next series to give the ball back to the Dolphins, but a fumble by Marino on the next play gave the ball back to the Patriots at the Miami 24. Five plays later, Bledsoe connected with Timpson for a five-yard touchdown and, with Bahr’s extra point, the visitors were ahead by ten at 28-18. Helped along by a pass interference penalty, the Dolphins responded with another long Marino TD pass, this time to Fryar for 54 yards. Stoyanovich’s kick made it a three-point game at 28-25. The Patriots had the ball for the remainder of the period and punted to start the fourth quarter. Two plays later, Kirby took a handoff and then tossed the ball back to Marino on a flea-flicker that resulted in another scoring pass to a wide-open Fryar, this time covering 50 yards. Stoyanovich converted and the Dolphins had their first lead of the day at 32-28. New England was far from finished and advanced 67 yards in seven plays. Bledsoe completed a pass to WR Vincent Brisby for six yards to convert a third-and-six situation at midfield and WR Ray Crittenden put the Patriots back in front with a leaping catch in the corner of the end zone of a Bledsoe pass for a 23-yard touchdown. Bahr’s successful conversion made the score 35-32 with 10:12 left to play. Following an exchange of punts, the Dolphins took over on their 20 with 8:50 remaining on the clock. 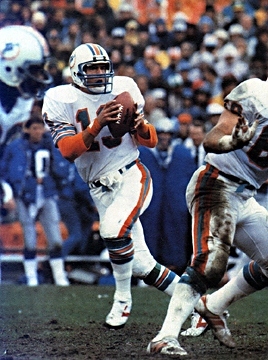 Marino passed to Kirby for 21 yards on a third-and-12 play and, shortly thereafter facing third-and-seven, he connected with WR Scott Miller for 18 yards. Four plays later, and facing fourth-and-five, Marino correctly surmised that the Patriots were in single coverage and threw to Fryar for a 35-yard touchdown. Stoyanovich’s PAT put Miami ahead by four points. Bledsoe came out throwing following the ensuing kickoff and hit Thompson for eight yards and Brisby for 19 to reach the New England 47. The next two passes fell incomplete before Coates caught a pass for a 23-yard gain, but the tight end fumbled when hit by Atkins at the end and SS Michael Stewart recovered for the Dolphins at the Miami 26 to nail down the 39-35 win. Both teams piled up yards, with the Dolphins compiling the most (525 to 472), although New England led in first downs (25 to 21) and time of possession (32:42 to 27:18). Each club turned the ball over three times. Dan Marino showed that he was back in good form as he completed 23 of 42 passes for 473 yards and five touchdowns while giving up one interception. Irving Fryar (pictured above) had a huge performance with 211 yards on his five catches that included three touchdowns. Mark Ingram contributed 87 yards and a TD on his three receptions and Terry Kirby, who rushed for 56 yards on 19 carries, also caught 7 passes for 61 yards. 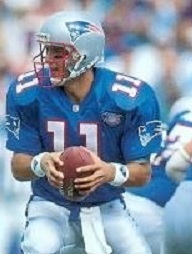 For the Patriots, Drew Bledsoe was successful on 32 of 51 throws for 421 yards and four TDs while being intercepted twice. Ben Coates topped the receivers by catching 8 passes for 161 yards and two touchdowns. Marion Butts led the miniscule running attack with 25 yards on 15 attempts, closely followed by Leroy Thompson’s six carries for 22 yards. The Dolphins won four of their first five games on the way to a 10-6 record and first place in the AFC East. They defeated Kansas City in the Wild Card playoff round before losing a close contest to the Chargers at the Divisional level. New England also went 10-6, losing both of its games to Miami to thus finish second in the division, and qualified for the postseason as a Wild Card entry. The Patriots lost to Cleveland in the Wild Card round. As the opening game foreshadowed, both quarterbacks had productive passing seasons. Dan Marino finished second in the NFL in pass attempts (615), completions (385), and yards (4453) and third in touchdown passes (30) and passer rating (89.2, best in the AFC). It was the emergent Drew Bledsoe placing first in attempts (691), completions (400), and yards (4555), although also interceptions (27), which were two more than his touchdown passing total (25). Both were chosen to the Pro Bowl (the eighth such honor for Marino, the first for Bledsoe). Likewise, the game’s top receivers remained productive all year. Irving Fryar, whose 211 yards against the Patriots were his career high, caught 73 passes for 1270 yards, both totals exceeding any of the previous ten years of his career, and seven TDs. 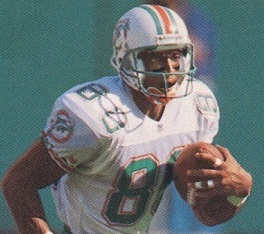 Ben Coates topped the AFC with 86 pass receptions, for 1174 yards and seven scores. Like Marino and Bledsoe, both were Pro Bowl selections.